Residence Borgo San Pietro is a converted farm of the 17th century. The restoration. aimed at the preservation of a historical good such as an antique house began in 1997 and took up the owners. with all their great enthusiasm. five years. The works have brought back the antique magnificence of the little village. emphasizing its typical characteristics such as the stone faade. the inside ceilings with beams. the cotto pavements and the fire places made of serena stone. all traditional building materials of the Valdichiana. The outside areas. with the stairs and the little alleys which. from the apartments. lead to the swimming pool. the landscaping. the wonderful arcade of the 1600s. and the antique well. all contribute to making this Relais/Hotel an enchanted corner of local history. 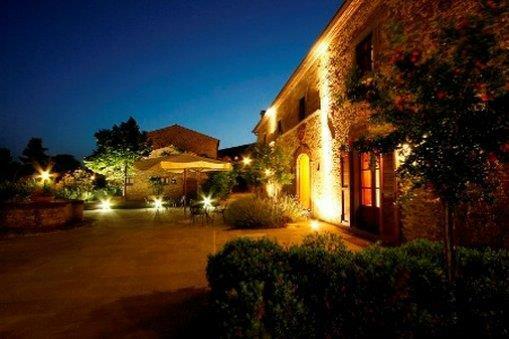 Relais Borgo San Pietro is a real discovery for tourists - immersed in the peace and quiet of the pleasant and abundant surrounding countryside. even thought it is close to residential areas and transportation routes. If you look up you will see the rooftops. belfries and towers softly reaching towards the west like a painting hanging in the air - it is Cortona. the oldest city in Italy. as written by the American writer Henry James enchanted by the city.